Williams involved the Proceeds of Crime (Money Laundering) and Terrorist Financing Act [the Act]. Williams had mistakenly tried to enter Canada, and upon doing so, erroneously declared that he did not have in excess of $10 000 CAD in his possession. $10 000 is the “reporting threshold” under s.12(1) of the Act, which mandates reporting, specified numerically in the Cross-border Currency and Monetary Instruments Reporting Regulations. Upon further inspection, Williams admitted that he was actually in possession of over $10 000 CAD but did not initially report the currency because he had not intended to come to Canada. Most of Williams’ currency was eventually seized as forfeit. The legal question turned on the reporting obligation in ss.12(1) and s.13 of the Act. The latter provides that a person who is required to report currency can “decide not to proceed further with importing or exporting” the currency “at any time.” Williams argued that he triggered s.13 by stating to an officer at the border that he did not intend to be in Canada. Once triggered, Williams argued that there was no need to report his currency under s.12. If this is true, then the border officials had no power under the Act to seize the currency. The Federal Court rejected Williams’ argument, holding that there was an obligation to report currency even though it accepted that s.13 was triggered. The Minister supported the Federal Court’s interpretation. In applying this methodology to the facts, Justice Stratas began with the duelling purposes of different provisions of the Act. While the Act was aimed at targeting criminal activity by keeping track of large cross-border currency flows, s.13 was aimed at a different purpose: the privacy interests of cross-border travellers. 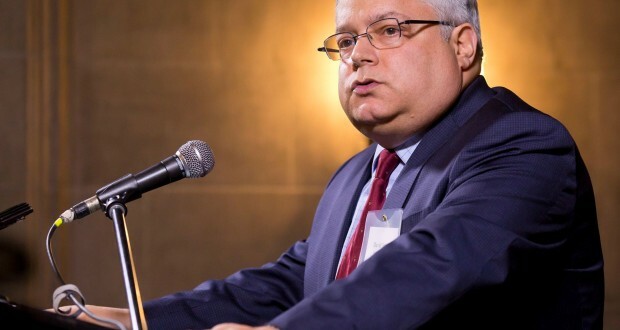 Resting on the canon that Parliament does not legislate in vain, Justice Stratas concluded that the Minister’s interpretation would render s.13 meaningless. Why would s.13, which is pointed at a different purpose, exist if it meant that a traveller would have to file a report under s.12? The text and context of s.13 supported the purpose. The words “at any time” in s.13 were, according to Justice Stratas, “precise and unequivocal.” Because Mr. Williams declared that he was not entering Canada, he was not importing anything requiring disclosure under s.12. Therefore, Williams rightfully triggered s.13 which meant he did not require a report under s.12. Based on this textual analysis, the Court held that the appeal should be allowed. Cheema concerned the “conditions that must be satisfied in order to obtain a new housing rebate under the Excise Tax Act and related regulations. Specifically, the question was whether the rebate was available to “A” if co-purchaser “B” simply signs an agreement of purchase and sale in order to enable A to obtain a mortgage, without B satisfying legislative occupancy requirements in the new home. Judges are only lawyers who happen to hold a judicial commission. Just like the people they serve, judges are unelected and are bound by legislation. What, then, is the right of judges to avert their eyes from the authentic meaning of legislation enacted by the elected, and, instead, to choose a meaning that accords with their own particular views of sensibility, practicality, and common sense? This statement is, in recent memory, the clearest in favour of a humbler judicial role in statutory interpretation. Williams and Cheema ask courts to focus their attention on statutory indicia of meaning, rather than external purposes which might otherwise affect the analysis. The cases properly root the argument in fundamental notions of democracy. In other words, the law agreed to by the people not only binds the people, but courts as well. How do Williams and Cheema apply this teaching in the world of administrative law? Williams and Cheema develop these rules by avoiding two “perils” of the purposive approach. First is the problem of “vertical abstraction”—stating a statutory purpose at a high level of abstraction which text cannot bear. Second is the problem of “horizontal frequency”—a number of statutory purposes, at the same or different levels of abstraction, stated across the statutory context. If courts do not properly characterize the statutory purpose, it could distort the judicial review function. I should note that these categories of “vertical” and “horizontal” statutory purposes are more conceptual than practical. In other words, it is often difficult to slot a particular case into any of the categories. Often, the categories will overlap. In the examples below, it will be evident that sometimes courts characterize a highly vertical statutory purpose which is horizontally removed from the case at hand. That said, this does not weaken the use of these categories as analytical descriptors for what courts do with statutory purposes. The vertical abstraction problem allows for courts to characterize a statutory purpose at an excessively high level of abstraction, overriding the text of the statute. This could lead to courts imposing a standard of review which is too deferential, beyond what the text prescribes. Williams and Cheema rightly counsel against this tendency. At the lowest level of abstraction, purpose must be substantially reflected in text— “the intent that a reasonable person would gather from the text of the law, placed alongside the remainder of the corpus juris.” In favour of this approach is a powerful ally: the principle of democracy. A court can only pass on what a legislature promulgated—not what it meant. After all, “[m]en may intend what they will; but it is only the law that they enact which bind us.” Anything else would require judicial crystal-balling beyond what a legislature enacted. Justice Stratas accepts in Cheema that text, context, and purpose must work synthetically at something resembling the lowest level of abstraction. He reasons persuasively that because judges are bound by law, courts cannot frame a purpose which supplants the legislature’s meaning. On the facts of Cheema, this means that whatever is “sensible or practical” in the eyes of judges—a highly abstract purpose—replaces Parliament’s intent, specified in language. After all, it is possible that in legislative language, Parliament created a scheme which from some policy perspectives may not be sensible or practical. Such a scheme is still legal. 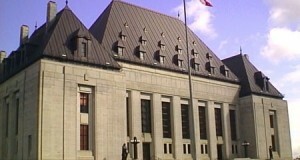 The Cheema approach is not in vogue at the Supreme Court of Canada, particularly in its administrative law cases. A case in point is the recent West Fraser case which hinged on the vertical abstraction problem. On land owned by West Fraser, a worker employed by an independent contractor suffered a fatal accident. The British Columbia Workers’ Compensation Board [Board] fined West Fraser for breach of a regulation it created, according to a broad statutory power under the British Columbia Workers Compensation Act to create such regulations for health and safety purposes. The legal basis for the fine was a provision of the Board’s enabling statute, which allowed the Board to “impose on an employer an administrative penalty” for breach of regulations. Whether the Board could impose a fine on an owner, when the relevant provision of the statute only indicates that employers could be fined, was a key question on appeal. The majority opinion, written by then-Chief Justice McLachlin, held that the Board was entitled to extend the fine to West Fraser as an owner. This conclusion flowed directly from the framing of the enabling statute’s purpose at a high level of abstraction. Chief Justice McLachlin wrote that the statute was “meant to promote workplace safety in the broadest sense.” In light of this broad purpose, the Chief Justice also addressed external factors to the statute, including the reason the regulation was adopted: as a “response to a concern in the province about the growing rate of workplace fatalities in the forestry sector.” In whole, Chief Justice McLachlin’s opinion implicitly said that any interpretation with some connection to a “health and safety” purpose would be reasonable. Justice Cote, in dissent, noted that the majority conflated the distinct responsibilities under the statute for “owners” and “employers,” an explicit textual purpose of the Board’s enabling statute. This purpose was supported by the fact that “owners” and “employers” in the Workers Compensation Act were separately defined, and the fine provision only spoke of “employers.” In other words, the broad statutory purpose framed by the majority had the effect of overriding the responsibilities evident in the text of the statute. While this was a valid purpose, the legislature pursued it through “limited means”—the specific text of the statute which provided that fines could only be extended to employers. The vertical abstraction problem displayed in West Fraser can be treacherous in administrative law. If a court abstracts a statutory purpose which is not substantially reflected in text, a broader foundation for deference may result. Because the text, context, and purpose of a statute control the range of reasonable outcomes available to a decision-maker, a purpose which is excessively broad will permit more reasonable options for a decision-maker, beyond what the actual text of the statute provides. In an extreme example, if a court claims that a statute is designed to affect the “public interest,” almost any interpretation rendered by the decision-maker would satisfy the reasonableness standard, because the term “public interest” permits many reasonable outcomes, as defined by the court. Characterization of purpose at this level is contrary to the comments in Williams and Cheema, which ask courts to identify the range of reasonable outcomes defined by the legislature. Otherwise, courts put the cart before the horse. Text is the method by which purpose is achieved by the legislature; purpose defined by the court does not dictate text. A critic might say that the health and safety purpose in West Fraser was represented in statute. This is true, but that argument ignores the role of text in statutory interpretation. The textual distinction between owners and employers in the statute is the specific method by which the legislature achieves the purpose of health and safety. On the logic of Cheema and Williams, the legislature agreed to the text of the law, not an empty purpose vessel filled with the ideas of courts. No matter, the disagreement in West Fraser goes to broader debates about the role of courts on judicial review. Legislation binds administrative decision-makers by prescribing the range of outcomes available to it. Absent constitutional objection, legislation also binds courts. So, courts must give effect to the range prescribed by legislation; not extend it through abstract purposes, nor attempt to decide “what is best for Canadian society” as Chief Justice McLachlin once described her role. This is the key holding in Williams and Cheema—the principle of democracy allows no other option. The vertical abstraction problem is a trap for courts applying the purposive approach. The Supreme Court seems to have fallen into this trap in West Fraser. Williams and Cheema, however, advise courts that they must give effect to authentic legislative meaning, especially when determining the range of reasonable outcomes available to a decision-maker. This is because legislatures are duty-bound to enforce the law as it stands. Williams and Cheema rightly focus courts’ attention on this baseline principle. The second issue, addressed in Williams, is the problem of horizontal frequency. If a statute can fairly encompass more than one purpose, which governs? Similarly, to the problem of vertical abstraction, a dose of judicial humility is required. Rather than selecting any purpose, the court should choose the one most local to the interpretive difficulty. In the case of such duelling purposes, worries of judicial subjectivity enter the fray. A judge, without any guiding rule, could select the purpose which best represents her particular worldview. On Justice Stratas’ view in Williams and Cheema, this is not only a problem of judicial methodology, but one of constitutional law—judges cannot overextend their role. It also presents similar problems of unpredictability. Litigants will be unsure which of the purposes will be selected by the judge. Williams shows a way to properly select the purpose. In that case, Justice Stratas identified the different purposes bearing on the interpretive difficulty; under s.3, the Act was aimed at “keeping track of cross-border flows” of currency, which fulfills larger public safety concerns. However, under s.13, the Act was directed at concerns of privacy. Those concerns were manifested in specific statutory text aimed at this “very limited” function. There is a duelling tension between these statutory provisions, but Justice Stratas resolved the issue by focusing on the statutory purpose which bore most heavily on discovering the meaning of the statute. It would do no good to discovering the meaning of the provision at issue in Williams to frame the purpose at the level of public safety and end the matter. Instead, Justice Stratas sensibly isolated the purpose bearing on the problem by referencing specific statutory text supporting that purpose. This principle of proximity, it could be called, is an ideal way to resolve the duelling purposes problem in statutory interpretation, and it may appear obvious. After all, it is most workable for judges and lawyers in hard cases to simply focus their energy on the statutory purpose most applicable to the case at hand. A reading of the statute as a whole, however, demonstrates another implicit statutory purpose which is more proximate to the dispute at hand: the creation of the Agency in the first place, with powers over its own processes, including its own rules for standing. No doubt, this purpose is only slightly less abstract than the general public interest purpose identified by the majority. But it duels with that purpose from a horizontal perspective; both could influence the problem at hand. In favour of the procedural purpose is the substantial textual support for it, as well as the procedural nature of the interpretive difficulty at hand. In the enabling statute, the Agency has “all the powers, rights and privileges that are vested in a superior court” (Canadian Transportation Act, s.25). Accordingly, the Agency may make rules respecting procedure (Canadian Transportation Act, s.17). Further, the Agency may “inquire into, hear and determine a complaint…” under the statute (Canadian Transportation Act, s.37). This highly discretionary language indicates Parliament’s intent to vest power in the Agency over its procedure. All of these textual indicators, all going to the procedural nature of a grant of standing, were not even adverted to by the majority. The Delta majority’s abstract purpose, on the other hand, was far removed from the procedural context of the case. The overall purpose of promoting accessible transportation relied on by the majority appears in a larger purpose statement in the statute, under the heading “National Transportation Policy.” The text reads that general objectives of essential, safe, and secure transportation at low costs occurs when “the transportation system is accessible without undue obstacle to the mobility of persons, including persons with disabilities” (Canadian Transportation Act, s.5(d)). The purpose statement does not speak to obligations on the part of the Agency, much less to mandate a certain test for public interest standing. Importantly, this purpose is not procedural in nature. One can see how the choice of purpose affects the result; in Delta, it counselled a more interventionist purpose. In every case, the only question is whether the enabling statute mandates or precludes the specific outcome reached by the decision-maker. Part of the statute is its purpose, and so the purpose may work to preclude a result. In Delta, a broad public interest purpose could accordingly render the Agency’s standing test unreasonable. This is because the test arguably could restrict public interest standing almost totally, which would be inconsistent with a public interest purpose. What constitutes “public interest” is defined by the court in a particular case and could be massaged to intervene in the Agency’s decision. But this purpose is not the defining one, following what Justice Stratas did in Williams. In Delta, because the question was in reality procedural, the procedural statutory purpose should have been the driving factor. The question was simply whether the Agency’s enabling statute precluded the adoption of its standing test. This textual difficulty fundamentally arose from s.37 of the Canadian Transportation Act which framed the Agency’s mandate to hear cases in discretionary terms. The fact that Parliament specified the Agency’s discretion in liberal terms indicates that it intended the Agency to determine its own processes, and in doing so, to pursue the public interest. This should have been the defining purpose for the Court in Delta. Choosing the most local purpose to the dispute at hand is in line with the democratic principle defined in Williams and Cheema. Parliament, in Delta, spoke in specific terms regarding the way the Agency should operate and control its resources. Those specific terms should be respected by courts. By relying on a far-removed purpose of “accessible transportation,” unconnected from the Agency, and superimposing legislative requirements from that purpose, the Court undermined Parliament’s clear textual intent. The empty vessel of purpose was filled with the Court’s, not Parliament’s, own definition. For lawyers arguing in the Federal Courts, Williams and Cheema are important precedents in statutory interpretation cases. Lawyers would do well to laser-focus their submissions on the text, context, and purpose of the statute, while remembering to address the larger values at issue, democracy and the rule of law. Seeking to subvert the text, context, and purpose of a statute to favour a particular result will likely be frowned upon in light of Williams and Cheema. Particularly, Williams and Cheema provide important tools for lawyers arguing cases in the Federal Courts involving the judicial review of legal questions. Williams and Cheema are a long time coming in the Canadian law of statutory interpretation. While the so-called “purposive approach” is accepted as scripture in Canada, courts have not investigated how to reconcile the various tools of the approach when they come into conflict, nor have analyzed what the conflict means for the organizing principles of the legal system. Lawyers should file Williams and Cheema as important cases that have made the law more predictable. Henry M Hart, Jr & Albert M Sacks, The Legal Process, William N Eskridge & Philip P Fricke, eds (Foundation Press, 1169): “Do not expect anybody’s theory of statutory interpretation, whether it is your own or somebody else’s, to be an accurate statement of what the courts actually do with statutes. 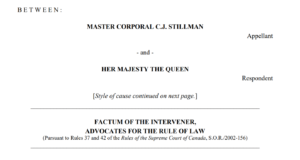 The hard truth of the matter is that American courts have no intelligible, generally accepted, and consistently applied theory of statutory interpretation.” While this is perhaps an overstatement in the Canadian context, the simple invocation of “text, context, and purpose” masks some broader debates about the nature of law and the role of courts in statutory interpretation. Frank H Easterbrook, “Text, History and Structure in Statutory Interpretation” (1994) 17 Harvard Journal of Law and Public Policy 61 at 69 [Easterbrook]. H. Wade MacLauchlan, “Judicial Review of Administrative Interpretations of Law: How Much Formalism Can We Reasonably Bear” (1986) 36:4 UTLJ 343. Thomas Paine, Common Sense, in Nelson F Adkins, ed, Common Sense and Other Political Writings 3 at 32. Aharon Barak, Purposive Interpretation in Law (Princeton: Princeton University Press, 2005) at 115. Antonin Scalia, A Matter of Interpretation: Federal Courts and The Law (Princeton: Princeton University Press, 1997) at 17. Joseph Breau, “ ‘Conscious objectivity’: That’s how the chief justice defines the top court’s role. Harper might beg to differ” National Post (May 23, 2015) online < http://nationalpost.com/news/conscious-objectivity-thats-how-the-chief-justice-defines-the-top-courts-role-harper-might-beg-to-differ? Lorne Sossin, “Access to Administrative Justice and Other Worries” in Colleen M Flood and Lorne Sossin, eds, Administrative Law in Context (Toronto: Emond Montgomery, 2013) 211 at 214.